From our Grayson Highlands backpacking trip. 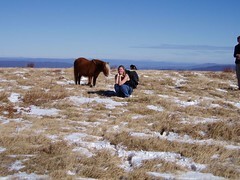 Every little girls dreams come true - wild ponies are still alive and well in the US! OK, "wild" in theory only - these stocky little guys were pretty tame, but that didn't make it any less cool to hike with them.